On the last day of October, 1811, Daniel Bedinger embarked upon an journey through and beyond the extent of the United States into wilderness of the newly acquired Louisiana Purchase, into territory held by the nation of Spain, and across Indian Territory inhabited by friendly and hostile natives and half-breeds. On the first leg of the journey, Daniel Bedinger and his son-in-law, Doctor Foster, may have been driven by his brother Jacob or a servant the few miles by carriage to the stage station in Boonsburgh [Boonsboro], Maryland. Daniel Bedinger probably chose Dr. Foster to accompany him on the journey because of lingering poor health from his ordeal in British prison during the Revolutionary War and his recurring symptoms of what is known today as tuberculosis. No doubt both Bedinger and the Doctor became better acquainted during this five month combination of adventure, pleasure trip and wilderness ordeal. The journey was made during a time of momentous historic national and international events: the Louisiana Purchase, the expansion of trade made possible by the cotton gin and an improved method for refining sugar cane, the accession of Spanish West Florida, the War of 1812, the defeat, submission, and expulsion of the native tribes from the the Alabama and Mississippi territory, and the westward rush of people to the settle in new lands. ​These events were instrumental in changing the very fabric of the nation, as Philip Freneau, prophesied in these lines from his 1775 poem, "The Rising Glory of America". Nations shall grow and States not less in fame"
On the first page of the journal, Daniel Bedinger recorded, in his fine Italian hand, the events of the first four days of the journey. Bedinger's original journal is held in the Bedinger and Dandridge Family Papers, David M. Rubenstein Rare Book & Manuscript Library, Duke University, Durham, North Carolina. The Journal of Daniel Bedinger is published in two parts. Part I follows; Part II may be linked here. Oct 31st - Left home with Doctor Foster on a journey to the Shores of the Gulph of Mexico. At Boonsburgh [Boonsboro, Maryland] took the stage, passed Hagerstown [Maryland] and Green Earth [Green Castle?] to Chambersburg. Nov. 1st Proceeded in the stage to Hartley’s, in company with Doctor McDowell, his daughter (Mrs. Read), Mr. Dowlans and others. Nov. 2d. Traveled over the hills to Summerset [Pennsylvania] and remained there all the next day being Sunday the 3d. Nov. 4th. Went on to Greensburg and the next day arrived at Pittsburgh. Nov 6th. Bought a small boat and provisions, etc. for the voyage. Nov. 7th. Sailed for New Orleans. Having with us is two young men to row the boat. Their names were Cornelius Dilly and Nelson Mays. Came to at a ferry below Beaver [Pennsylvania]. Adventure of the Savages. November 8th. Overtook Mr. Gage who was going with Negros to the Bayou Sara. Passed by Holliday’s Cove, Stuebenville [Ohio] and came to anchor opposite Charlestown, Brook County, Virginia [now Kentucky]. Nov. 9th. Passed Wheeling and Grave Creek. Landed at the latter place and went to see the great mound. Lay all night at a few miles below. Nov. 10th. Sunday. Overtook and passed the boat Friendly on board of which were Misters Delany, Powell, Berryhill and Lewis. Stopped at the head of the long reach. Nov. 11th. Passed by Marietta [Ohio], Vienna [Ohio], and Bellpre [Ohio] to Blennerhasset Island. Nov. 12th. Landed at Bellville [now West Virginia] and lay all night at Ambersons Island [now Buffington Island]. Nov. 13th. A curious waterfowl. High winds. Passed Letarts Falls. Nov. 14th. Point Pleasant [now West Virginia] to Galiopolis [Ohio]. Nov 15th. Little Gyandot to the Bluff and Tavern. Nov 16th. Rain, to Bigstone Creek. Nov. 17th. Sunday. To the mouth of Sciota River, Portsmouth [Ohio] and Alexa. Nov. 18th. Salt Lick Creek [Lewis County, Kentucky]. Dined with J. Morgan and went to Adamsville. 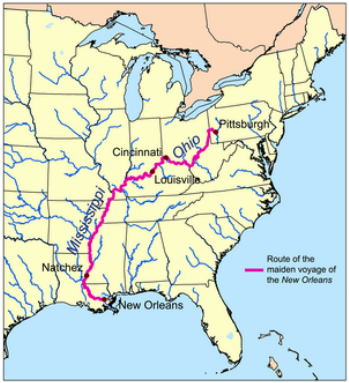 The route of Daniel Bedinger and Doctor Foster from Shepherdstown to Pittsburgh, by horse or carriage and stage to Pittsburgh where they went by boat down the Ohio and Mississippi Rivers to New Orleans. Filled with the spirit of adventure, excitement of entering an untamed wilderness, and perhaps some foreboding of the unknown obstacles that lay ahead, at the end of the first day on the river, Daniel Bedinger inscribed in his journal "Adventure of the Savages". Bayou Sara, now in the State of Louisiana, on the Mississippi River near St. Francisville, was a trading post and cotton port between Natchez and New Orleans. J. Morgan is probably Joseph Morgan (19), Daniel’s nephew, son of his sister, Elizabeth Bedinger Morgan. Henry Clay Bedinger, another nephew of Daniel and oldest son of his brother George Michael Bedinger, was a few later years also a resident of Lewis County. Nov. 19th. Arrived at Maysville, purchased stores, and had some washing done, which detained us all the 20th. Here we first heard accounts of the late battle with the Indians on the Wabash River. Wrote home. Nov. 21st. Descended to Augusta [Kentucky]. Nov. 23d. Touched at Cincinnati, and lay at Lawrenceburg, just below the Great Miami River where the Indiana Territory commences. Nov. 24th. Sunday. Met the Steamboat [New Orleans] near Big Bone Lick [now a Kentucky State Park], at night lay alongside the Friendly on a bar aground. Nov. 25th. Passed the mouth of Kentucky River and stopped at Westport. Nov. 27th. Passed the falls [of the Ohio River] to Shippingport. Nov. 29th. Engaged a passage to New Orleans on board the Barge Louisville, Capt. Joel Craig. December 1st. Sunday. Commenced to voyage anew and came to 4 miles above the mouth of the Salt River. Dec. 2d. Moved on to Mr. Funks 6 miles above the Blue River. Dec. 3d. In the evening got aground on a bar just below Flint Island. Dec. 4th. The river on the rise. Got off early, but made only 16 miles. Dec. 5th. Bad weather moved on only a mile and a half. Dec. 6th. A good days run. Came to 4 miles below Anderson’s Ferry. Dec. 7th. Stopped at an island near the Yellow Banks. Dec. 9th. Passed Henderson town [Kentucky] and Diamond Island. Dec. 10th. The mouth of the Wabash River and lay all night at the Shawneetown [Illinois]. Dec. 11th. The Saline River, Great Cave and came to amongst rocks. Dec. 12th. Landed at the 1000 ____ opposite the 2nd Sirtus Island, John W. Daniel, tenant. Passed Cumberland and Tennessee Rivers and at night landed at Fort Massac. Dec. 13th. In the evening came to at the mouth of the Ohio River where were lying the Barges Ohio and Venus, Captains Becktle and Hedington. At Maysville, Kentucky, Daniel Bedinger took the opportunity to write to his wife, Sarah, now five months pregnant with their eleventh child. There would be few post exchanges on the journey that would afford Daniel Bedinger the opportunity to send letters to his wife and friends in Shepherdstown. 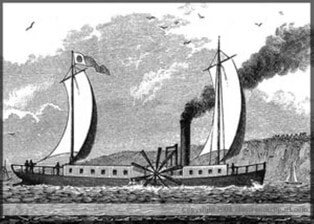 The "New Orleans", steamboat of Robert Fulton. 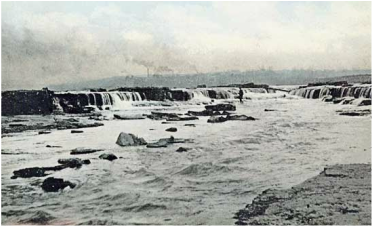 The small boat of Bedinger and Foster had no difficulty traversing the falls of the Ohio, but the Captain of he New Orleans waited about a month for the waters of the Ohio River to rise enough for the steamboat, with a draft of less than six inches, to safely pass over the treacherous falls. This map of the the main Post Road shows the few stations where Bedinger and Doctor Foster could send letters during their journey. A few stations had been added since this map, dated 1804. A station at Baton Rouge, on the Mississippi River between Natchez and New Orleans, had been added after the western part of Spanish West Florida Territory was ceded to the United States in 1810. Dec. 15th. Sunday. Therm. 40 and 49. Got under way, met with a barge bound up the river from New Orleans (which place she had left in June last.) Proceeded down to New Madrid where Daniel Bedinger and Doctor Foster went on shore. A fine handsome bank but the place little improved. Descended the river to the Island No. 13 which lies (according to the observations of others) in Lat. 36 deg. 20 min. N. The weather was dark all day, the atmosphere very heavy and appeared something like what is vulgarly called Indian Summer. Came to anchor in smooth water near a low sandy beach on this island. Dec. 16th. About 2 o’clock in the morning were alarmed by an unusual noise, seemingly near the bottom of the Barge attended with a violent trembling and shaking of the vessel. All the boats in company were at the same time equally affected, so that all were soon convinced that the cause was no other than a violent shock of an earthquake, which lasted (without intermission) about 40 seconds. Immediately after which the boats rolled considerably (tho there was no wind). The river appeared to be much agitated. It was suddenly covered with a thick froth. It rose at least 18 inches in a few minutes time, and became very rapid where the vessels lay. Note 1. From this circumstance it was afterwards concluded that, as this froth was evidently (brought forth) by the ebullitions or frothings of water, forced, during the concussion, from the bottom and sides of the river through innumerable ducts and openings, and as it floats off from the stream, in so short a span of time. The most violent effects of the earthquake would not have extended, been felt or experienced on the river at any considerable distance, many miles, above this place. In the meantime the confusion which seemed to reign on all sides was awfully alarming. Many areas of land in a body (as was discovered on the approach of day) had sunk to a level with the surface of the river, and some much lower, leaving only the tops of the trees above water. Where the banks did not immediately tumble in, vast vents or fissures were made in the earth to an unknown extent. Some of these fissures received the waters of the river and others ejected those of the neighboring lakes and ponds, with no inconsiderable roarings. 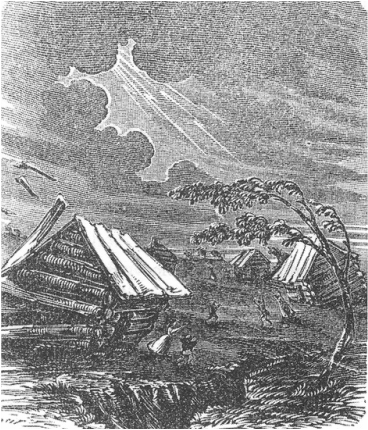 Frequent rumbling sounds were heard resembling distant thunder and numerous heavy reports indicative of explosions seemingly from the bottom of the river and the low lands adjacent, together with the falling and cracking of many large and heavy trees, at the same moment, seemed to threaten the most direful consequences of not universal destruction. Immediately after the first shock the thermometer was observed to be at 45. About 30 minutes after the first shock a second was felt, it was less violent and of shorter duration than the first. Two hours after another came on, but it was more moderate than either of the other two. From this time until daylight nothing material occurred except repeated rumbling sounds seemingly at a distance, and a continued falling in of the banks of the river. Early in the morning the boats all got underway and stood down the river. The thermometer at sunrise was still at 45. No perceptible change was observed in the temperature of the river water. Nothing was seen like lightening, fire, or smoke or anything of a volcanic nature. The weather remained dark and cloudy and the winds were light and variable. About half past 7 o’clock A.M. there was another shock which for violence (it was agreed by all on board) exceeded the first, but it lasted only about 20 seconds. Soon after was seen a short distance from the headmost boat, a large spout or body of water, rising from the surface of the river to the height of 18 or 20 feet when it seemed to burst and was instantaneously followed by a loud report. Similar reports were heard from the neighboring low grounds, at various distances from the river. A great number of old logs and trees of an enormous size was cast up to the surface from the bottom of the channel, which caused the navigation always difficult here, to be still more dangerous. The mischief done by these logs cannot be ascertained but Mr. Atwell of Salt River, Kentucky lost two boats with their cargoes by the seizing of one of them, which was his first boat and of the others being lashed to him they both went down together. The people were saved. Note 3. Below this place the country, for several hundred miles, is an uninhabited wilderness, excepting only at the 4th Bluff, where there is a small settlement. In the evening all the boats in company came to near the Island No. 23. A landing was here made and it was found that every part of the beach as well as the high land had been much rent and torn to pieces. Numerous openings, or holes remained which all had the appearance of having discharged large quantities of water, sand, mud, and fragments of wood which in color and weight, greatly resembled mineral coal. Some specimens [were brought away]. Dec. 17th. Therm. 53 and 49. The wind first West and then N.W. The morning very dark and cloudy. At 6 O’clock A.M. two shocks, each of short duration. At 30 minutes past noon one or more violent occasional rumblings. Descended the river this day to the head of the Canadian reach. Dec. 18th. Therm. 30 and 45. Remained at anchor (being wind bound) all day. Wind strong at N.W. At 45 minutes past 11 A.M. a slight shock, and at 4 P.M. another. Dec. 19th. Therm. 25 and 36. Wind, first West, then variable, a clear day. Proceeded to the first Chickasaw Bluff and landed. On the high ground discovered no marks of the earthquake. Near the river the banks were broken, but nothing like those at Little Prairie. A slight shock or jar at 3 P.M.
Dec. 20th. Therm. 31 and 37. Cloudy, a shock at 11 A.M. just at passing of the 2nd bluff. Some rain this day. Came to below the 3rd bluff. The barge that Bedinger and others encountered bound upriver demonstrated the practical reason by which barge men rarely attempted to navigate upstream. 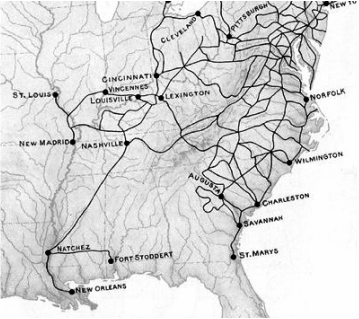 The laborious feat of rowing and poling upstream against the current had taken five months, whereas from this point the Louisville would take slightly less than two months in its downstream journey to New Orleans. The water of the river changed to a reddish hue, and became thick with mud thrown up from its bottom while the surface was covered with foam, which adhering into masses the size of a barrel, floated along on the trembling surface. The earth on the shores opened in wide fissures and closing again threw the water, sand and mud in huge jets higher than the tops of the trees. From Richard Miller Devens, 1879, p, 219, Our First Century: One Hundred Great and Memorable Events in the History of our Country, C.A. Nichols & Co,, Springfield Mass. Bedinger and Doctor Foster had gone ashore at the town of New Madrid the day before the earthquake struck. During the earthquake many of the buildings in the town were shaken down and swept into the Mississippi River. John James Audubon, the artist and naturalist, who was nearby in Kentucky during the quake wrote, "...all the shrubs and trees began to move from their very roots, the ground rose and fell in successive furrows, like the ruffled waters of a lake...I too plainly discovered that all this awful commotion in nature was the result of an earthquake." From: Rhodes, Richard, 2004, John James Audubon The Making of an American,Alfred A. Knopf, New York, 514 p.
Reelfoot Lake in Tennessee created by the New Madrid Earthquake. Other areas subsided by as much as 5 meters, although 1.5 to 2.5 meters was more common. Lake St. Francis, in eastern Arkansas, which was formed by subsidence during both prehistoric and the 1811-1812 earthquakes, is 64 kilometers long by 1 kilometer wide. Coal and sand were ejected from fissures in the swamp land adjacent to the St. Francis River, and the water level is reported to have risen there by 8 to 9 meters. Large waves (seiches) were generated on the Mississippi River by seismically-induced ground motions deforming the riverbed. Local uplifts of the ground and water waves moving upstream gave the illusion that the river was flowing upstream. Ponds of water also were agitated noticeably. Believing the effects of the late Earthquake to have been different in different sections of he country, and that reports at Washington, however diversified were nevertheless such as to excite curiosity; I take the liberty of sending you the enclosed paper which, at the leisure moment may, perhaps, afford some little amusement, & which you will be pleased to dispose of in any manner you think proper. We are gratified on being able from so respectable a source to lay before our readers an authentic account of the phenomena exhibited by the Earthquake on the Mississippi. 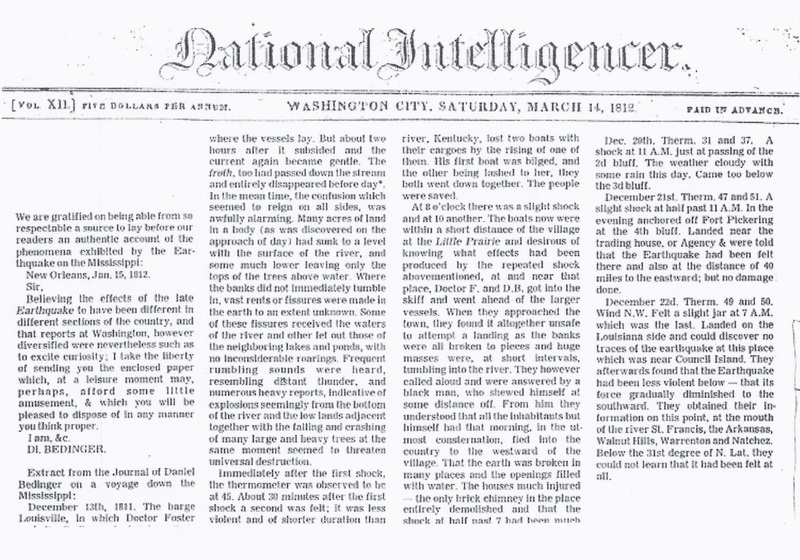 The extract from Bedinger's journal was published March 14, ten days before Daniel Bedinger and Doctor Foster arrived home in Shepherdstown. The geologic record of pre-1811 earthquakes reveals that the New Madrid seismic zone has repeatedly produced sequences of major earthquakes, including several of magnitude 7 to 8, over the past 4,500 years. 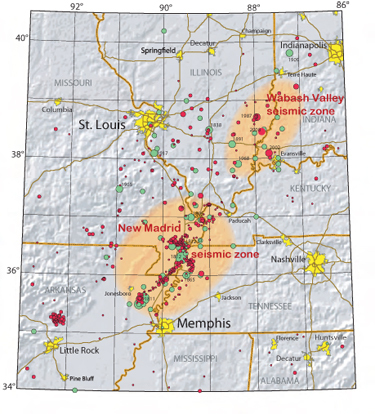 This map shows earthquakes (circles) of the New Madrid and Wabash Valley seismic zones (orange patches). Red circles indicate earthquakes that occurred from 1974 to 2002 with magnitudes larger than 2.5 located using modern instruments (University of Memphis). Green circles denote earthquakes that occurred prior to 1974 (USGS Professional Paper 1527). Larger earthquakes are represented by larger circles. Dec. 21st. Therm. at 47 and 51. Winds ligh, atmosphere cloudy and smoky. A slight shock at half past 11 A.M. Anchored off Fort Pickering at the 4th Bluff. Landed near the trading house or Agency and were told that the earthquake had been felt there and also at the distance of 40 miles in the country to the eastward. Note 2. They afterwards found that the earthquake had [____ ____] below, that its force gradually diminished to the southward. They obtained their information at this point at the mouth of the river St. Francis, the Arkansas River, Walnut Hills, Warrenton, and Natchez. Below the 31st degree of North Lat. they could not learn that it had not been felt at all. Dec. 23th. Therm 32 and 43. Wind bound all day. Dec. 25th. Therm. 26 and 51. An Indian with his wife and child came alongside in a canoe. Purchased some venison. Wind S.E. clear fine weather. Anchored near No. 66. Dec. 26th. Therm. 32 and 58. Cloudy in the afternoon. Fine mild weather. Wind south. Saw several parties of Indians this day. Came to just below White River. Dec. 27th. Therm. 36 and 51. Touched at the mouth of the Arkansas River. Water of that river, red. The earthquake has been sensibly felt, but had done no damage. Anchored off No. 79. Dec. 28th. Therm. 33 and 56. Passed point Sisco[? ], a small settlement on the Louisiana side. Stopped hear No. 85. Dec. 29th. Therm. [?] Large flocks of pelicans. Their beautiful flight. Came to near No. 91. Dec. 30th. Therm. 49 and 52. Rain. Fog. Came 7 or 8 miles, weather too foggy to proceed further. Rain, lightning, and thunder at night. Dec. 31st. Therm. 29 and broke. Wind bound at No. 93 rain the greater part of the day. Wind N.W. January 1st Calm and cloudy in the forenoon. Clear fine mild weather in the afternoon. Passed white settlement from which there is a road to the Washita River [now the Ouachita River]distance 45 miles. Lay all night just below No. 100. Jany. 2d. Got underway early and passed the famous Yazoo River. Soon after had a fine view of Walnut Hills. In the afternoon passed the town of Warrenton a handsome looking little place. Anchored at night just opposite the head of Palmyra settlement. Both banks of the river are settled and cultivated in spots here. Jany. 3rd. Got underway about 5 o’clock in the morning. The weather clear but rather cold. Passed by Black Creek just above what is call the Grand Gulph. The land on the left side very high, the shore rocky. The hills terminate at the river, but how far they extend from it, to the eastward, could not learn. The next noted place was Bayou Pui (Judge Bruins) below which lies the Petit Gulph. On the east side, some beautiful high hills also terminate at the river No. 113. Jany. 4th. Dark rainy weather some thunder near Costs Creek. The land here and for many miles above of very handsome appearance being almost entirely free from planters and service. Rain all day long. Arrived at Natchez at half past 1 P.M.
Jany. 5th. Sunday. A rainy cloudy day. Went up into the City. A small place with very dirty streets. The landing too is a very bad one. Some situations in the country have (at a distance) a ___appearance. The steam boat [New Orleans] sailed about 12 O’Clock. At half past one the Louisville put off. Passed St. Catherine’s landing in the evening and came to opposite Ellis’s Cliffs. Jany. 6th. Proceeded down the river. Loftus Heights or Fort Adam. The “stew this day was very good, it being served up soon after the Doctor washed his shirt”. The weather cold in the forenoon, mild towards evening. Passed the mouth of Red River and lay all night just below the Bayou Chaffalio. Jany. 7th. A heavy white frost and ice on deck at sunrise. Soon after passed the steam boat at anchor. The Bayou Tunica on the left, where the highland shows itself. Fine mild weather, tho not perfectly clear. Came to anchor opposite to the head of Point Coupee Settlement, a beautiful country. Jany. 8th. A cloudy morning. Passed Bayou Sara and St. Francisville, Thompsons Creek and the cliffs below. At the next bend were in sight of Baton Rouge, a high fine situation. The country opposite beautiful beyond description, at least in the eyes of those who had lately been accustomed to Earthquakes and other dreary scenes. In the afternoon came to opposite the town. Waited on the officer of the guard Lieut. Bell, who politely sent his corporal with us to look for Lieut. Henshaw. Wrote to Jno. T. A. Washington, Esq. Jany. 9th. Wrote to Shepherd B[rown]. Cloudy weather were detained until one P.M. when weighed anchor. A snow storm with very little wind. Snow-snow-snow. Jany. 10th. Lay last night at anchor near the Bayou Manchack (Iberville River). Bad weather all night. This morning the snow was 5 inches deep on deck. Passed the Bayou Plaquemine a fine settlement just below, on the same side and anchored near the Bayou la Fourche. Jany. 11th. Bad cold weather. Both banks of the river well settled. Passed Baranger and lay by the bank near Bona Cara Church. Jany. 12th. Clear and cold. Wind north in the morning, in the afternoon mild. Passed many beautiful seats [mansions] and sugar plantations this day and soon after sunset anchored at the suburb of St. Marys, City of New Orleans. Military posts and larger towns on the Mississippi River, such as Natchez and Baton Rouge [xi], were some of the few places where letters could be posted. The letter Daniel Bedinger posted at Baton Rouge to his son-in-law John Thornton Augustine Washington [xii]. Shepherd Brown was a friend of Daniel Bedinger from Shepherdstown, Virginia. His letter to Brown, Bedinger may have been informing Brown, a young merchant in the New Orleans area, that he and Doctor Foster soon would be arriving in New Orleans. [i] When Daniel Bedinger and Doctor Foster arrived in Maysville, Kentucky they heard the news of the battle led by Gen. William Henry Harrison against with the followers of Shawnee Indian Chief Tecumseh at the Wabash and Tippecanoe Rivers. The battle, came to be referred to as Tippecanoe, possibly because of its use in the melodious cry "Tippecanoe and Tyler too" from the later time of Harrison's bid for the Presidency. Chief Tecumseh had tried to recruit allies among the five civilized tribes, the Cherokee, Chickasaw, Choctaw, Creek and Seminole. A faction of the Creeks, the Red Sticks, of the Mississippi Indian Territory, answered his call and were belligerently opposed to incursions or travel by whites through their territory. Bedinger and Doctor Foster would travel through the Red Sticks' territory on their return from New Orleans. [ii] The steamboat New Orleans was designed by Robert Fulton and Edward Livingston, built in Pittsburgh in 1811 and launched October 15th, about two weeks before Daniel Bedinger and Dr. Foster arrived in Pittsburgh. The maiden voyage of the New Orleans from Pittsburgh to New Orleans began October 10th, the first steamboat to navigate waters west of the Appalachian Mountains. The Captain of the steamboat New Orleans was Nicholas Roosevelt, the great uncle of President Theodore Roosevelt. [iii] Daniel Bedinger and Doctor Foster were no doubt pleased to engage passage aboard a commercial barge in transit to New Orleans. The barge would provide them with shelter and an experienced Captain to navigate the waters of the Ohio and Mississippi Rivers. Travel of migrant families moving westward and transportation of goods to New Orleans and St. Louis began to open up at the close of the French and Indian War. Boat building became a thriving enterprise in Pittsburgh and other ports on the Ohio river. The flat boats were made form lumber from the native trees of the Ohio River Valley. The boats had no standard size and were outfitted to suit the needs of the owners. Smaller craft might have only a shed; larger vessels might have a shed in the rear for horses and cattle and a cabin forward for the shelter of the passengers and crew. Barges transporting commercial goods for ale in New Orleans would be covered throughout their entire length. The boats would have a large oar or rudder at the stern and large oars on each side to maneuver the boats into port and the avoid shoals and snags and to maintain a desirable coarse in the river. Flat bottomed barges were made for downstream travel, but impractical to row or pulled upstream by ropes from the river bank. Barges were thus one-way vessels and were dismantled ans old for lumber a their downstream destination. Boatmen completing a voyage to New Orleans or Natchez would return home by the Natchez trace by foot, wagon or horseback. Keel boats, narrower than barges with were with hydrodynamic keels, that permitted the rowing or cordelling of he vessel against the current. By such vessels, cargo was transported up thye Mississippi River from the mouth of the Ohio River to St. Louis. River travel increased at the conclusion of the American Revolution with the settlement military land claims and increased transport of goods to New Orleans. The largest impetus to the transportation of American cargo by barge down the Mississippi to new Orleans was the Louisiana Purchase in 1803. To President Jefferson, the importance of New Orleans could not be overstated. It was through New Orleans which the produce of three-eighths of the producer of the U. S. passed to market. The first earthquake of December 16, 1811 caused only slight damage to man-made structures, mainly because of the sparse population in the epicentral area. The extent of the area that experienced damaging earth motion, which produced Modified Mercalli Intensity greater than or equal to VII, is estimated to be 600,000 square kilometers. However, shaking strong enough to alarm the general population (intensity greater than or equal to V) occurred over an area of 2.5 million square kilometers. The earthquakes caused the ground to rise and fall - bending the trees until their branches intertwined and opening deep cracks in the ground. Deep seated landslides occurred along the steeper bluffs and hillslides; large areas of land were uplifted permanently; and still larger areas sank and were covered with water that erupted through fissures or craterlets. Huge waves on the Mississippi River overwhelmed many boats and washed others high onto the shore. High banks caved and collapsed into the river; sand bars and points of islands gave way; whole islands disappeared. Surface fault rupturing from these earthquakes has not been detected and was not reported, however. The region most seriously affected was characterized by raised or sunken lands, fissures, sinks, sand blows, and large landslides that covered an area of 78,000 - 129,000 square kilometers, extending from Cairo, Illinois, to Memphis, Tennessee, and from Crowley's Ridge in northeastern Arkansas to Chickasaw Bluffs, Tennessee. Only one life was lost in falling buildings at New Madrid, but chimneys were toppled and log cabins were thrown down as far distant as Cincinnati, Ohio, St. Louis, Missouri, and in many places in Kentucky, Missouri, and Tennessee. [vi] The New Madrid earthquakes, named after the largest settlement on the Mississippi River between St. Louis Missouri and Natchez, Mississippi. The New Madrid earthquakes of 1811 and 1812 witnessed by Daniel Bedinger were the strongest earthquakes ever recorded in North America having magnitudes of 7.5. Bedinger, Doctor Foster and the crew of the barge Louisville were very near the epicenter of the earthquake during the first quake on December 16, 1811. [vii] The magnitude of the quakes of 1811-12 are estimated from eyewitness accounts, such as that of Daniel Bedinger and geologic field studies of earth movements and displacements on the physiography and geology. The area of strong shaking associated with these shocks is two to three times as large as that of the 1964 Alaska earthquake and 10 times as large as that of the 1906 San Francisco earthquake. (http://pubs.usgs.gov/of/2008/1128/). [viii] Fort Pickering, on the bluffs at the site of present-day Memphis, Tennessee, was a frontier station and trading post built in 1798 which remained in operation until 1814. The Memphis bluffs had already been home to a number of military fortifications, including French Fort Assumption, Spanish Fort Fernando de las Barrancas, and early American Fort Adams. A small town grew up around the fort and was later incorporated into the city of Memphis during a period of rapid growth in the mid-1800s. [ix] The river referred to as “Washita”, also spelled Wachitta of the time, is now the Ouachita River, phonetically pronounced “washita”. The Ouachita River heads in the Ouachita Mountains of Arkansas and joins the Red River of Louisiana above the confluence of the Red and Mississippi Rivers. [x] Bedinger and Doctor Foster on the barge Louisville caught up with he steamboat New Orleans at Natchez. At ports the steamboat was a great attraction. All the residents, having never seen a steam powered vessel and many having never heard of such, were skeptical that the boat could go upstream under its own power. The Captain would give the residents rides on the steamboat to show its ability to power upstream against the river current. The New Orleans arrived at New Orleans January 10, two days before Daniel Bedinger and Doctor Foster arrived on the Louisville. After its maiden voyage, the New Orleans spent its days transporting mail, goods, and passengers between New Orleans and Natchez. The historic steamboat met its demise after hitting a snag in the river and sunk to the depths of the mighty Mississippi. [xi] Baton Rouge had recently been a part of he Spanish Territory of West Florida. The Spanish hold on this territory was tenuously held and was overthrown 1810 by American settlers who were dissatisfied with Spanish rule. The Baton Rouge region was soon thereafter to become a part of United States territory. [xii] Military posts and larger towns on the Mississippi River, such as Natchez and Baton Rouge, were some of the few places where letters could be posted. The letter Daniel Bedinger posted at Baton Rouge to his son-in-law John Thornton Augustine Washington, the husband of his daughter Elizabeth Conrad Bedinger. The couple lived a “Berry Hill”, afterwards “Cedar Lawn”, in Jefferson Co., Virginia. [xiii] Bedinger and Doctor Foster arrived in New Orleans January 12, 1811. There are no entries in the journal for the period January 13 to January 3, 1812 when Daniel Bedinger and Doctor Foster were in New Orleans. They would have been exploring the city and visiting friends, among whom were Rezin D. Shepherd, from Shepherdstown, a very successful trader in New Orleans, with whom Daniel and the Doctor were well-acquainted. Shepherd Brown a near relative of Rezin Shepherd, and Mr. McDonough, a business associate of Rezin D. Shepherd, were also in the New Orleans area and are mentioned in Bedinger’s journal. A chain of events in the early 1800s thrust upon New Orleans a into a accelerated period of growth in population and trade. 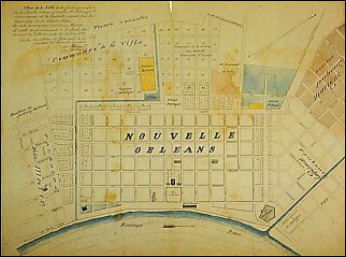 Well aware of the importance of New Orleans to the vitality of America with the trade at the port of New Orleans, the acquisition of New Orleans was the main objective of President Jefferson in the purchase of the Louisiana Territory in 1803. The invention of he cotton gin had expanded the production of cotton and expansion of sugar cane cultivation and sugar production greatly increased the trade and shipping of products to domestic as well as international markets. Now that New Orleans was a possession of the United States, there would be no import duty on goods shipped from New Orleans to U. S. ports of the eastern seaboard. The conditions were optimum for wealth to be made by intelligent, knowledgeable and enterprising traders. The city population was also burgeoning with refugees from the Haitian Revolution arrived in New Orleans by 1809. The migration brought some 9,000 people to New Orleans, about a third each of whites, free persons of African descent, and enslaved persons, doubling the population. While in New Orleans, Bedinger and Doctor foster would have made contact with Rezin D. Shepherd, an old friend from Shepherdstown, Virginia. Rezin Davis Shepherd, 1784-1865, son of Captain Abraham Shepherd and Eleanor Strode, when about 16 years of age was placed in the store and counting house of William Taylor, of Baltimore, a large importer and ship owner. 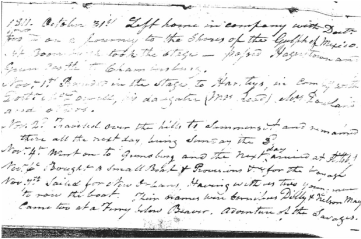 In September 1802 the Baltimore house sent him to New Orleans, where he worked with John D. McDonough in disposing of a large consignment of goods from England. The following winter Rezin D. Shepherd returned to Baltimore with the accounts all balanced and a large remittance in specie. His reputation with William Taylor was made. The Purchase of Louisiana opened a pathway to wealth for Rezin Davis Shepherd. His employer saw the net profits to be made by bringing sugar into the States without having to pay a heavy import duty, So, Shepherd again set out for New Orleans with secret orders to buy all the sugar possible and succeeded in getting 1,800 of the 2,100 hogsheads then produced in Louisiana. He was rewarded with a handsome share of the profits, sufficient in fact to enable him to start as a merchant and importer own his own account.